I was very hesitant to give such high marks, not wanting to start the marks too high and ruin [Bass Inside's] credibility, but the bass deserves such high marks and so does Heiko. Overall, the positive items on the bass far outshadowed any hesitation we may have about playing a non-wood intrument. In the end, it was a bit difficult giving the instrument back, it was that good! Lightweight hollowbody carbon-based material, body and neck are one piece, and the neck is also hollow. Neck 34" scale and 24 frets. Active BassXX pre-amp, custom-made to BassLab's specifications, three-band-EQ: 2xVolume (front one with mute push button); double-potentiometer bass/treble with active/passive switch; mid-gain; mid-frequency. 1 x 9 Volt. 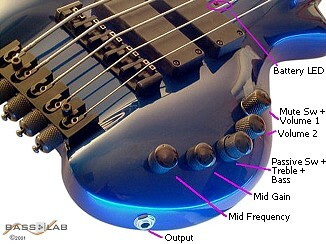 Note: Our test model had a little LED between the two pickups that will flash when the battery starts to fade. Black hardware. Bridge and Tuner ABM. 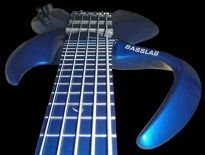 As usual for a headless bass, the ABM tuners are located at the tail of the instrument. Normal (single-ball) strings are used, with the free end clamped at the head and the excess string trimmed off. Custom instruments can be created with any combination of tuners, pickups, and electronics, and also variable neck profiles, body shapes, and lacquer colours. 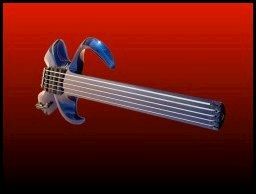 Typical options are: 4, 5, or 6 strings, fretted or fretless, headed or headless, BassXX or DaCapo pre-amp, 2 or 3 pickups, colour. Approx. 2.8 kgs (6.2 pounds). Depending on the model the weight varies from 2.6 to 3 kgs (5.7 to 6.6 pounds). There are actually two versions: light and heavy. Our test model was 'heavy', which is the standard and more for the rock-bottom sound, while the light version has a more acoustic and mid-range Sound.